A number of years now reading and posting here and the sentence that rings in my ears as the best advice I've ever had in home baking is Pat's "Get the fermentation right," which I guess could also be said as "Watch the dough, not the clock." Now that the rest of you have moved on to the nicely controlled environment of proofing boxes , I am left to my analog temperature probe and the vagaries of kitchen temperatures. So I've practiced on some basics, watching the dough. Here are three recent examples: A basic boule, Tartine-ish for the relatively young starter and for the covered cast iron bake; Silverton-ish for practicing the half moon score. I'm liking the cast iron right now. Proofed overnight in the fridge and baked from cold. A combination of Hamelman's five grain and his seeded levain. This one has whole wheat, steel cut oats, wheat germ, pumpkin seeds, sesame seeds, flax seeds. Need to bear in mind that when fewer cereals go in the soaker (and more seeds not needing to be soaked are used,) the water for it should be cut back. As it is, the dough took some more flour and turned out fine. It's not for nothing that Hamelman says this is one of the most delectable of breads. Despite all the inclusions, the crumb is light and properly aerated. Again proofed overnight in the fridge, but not baked from cold because they hadn't come up enough. I like the zigzag scoring on the large one. Next week I think I'll add a couple of tablespoons of dark rye and/or buckwheat to this formula, just to see what they do to the taste and the form. Wet baguettes. For a long time, I had mixed feelings about these. I couldn't put my finger on it. But now I think I know what's bothering me: this isn't a baguette. A dough this wet, one that can't be properly shaped or scored, doesn't really fulfill the complete idea of the baguette, with its beautiful pointed ends and caramelized ears. This is more likely to be a baton, a long narrow loaf that doesn't need to be scored. Its natural form is ciabatta. Next week, I may try these as batons. If you picture these loaves below, a little wider and a little shorter and unscored, that's the idea. I hydrated the non pre fermented flour and water for 24 hours in the fridge. I also fermented the bulk dough for 24 hours in the fridge. I proofed the formed loaves for too long on the bench, about six hours. So, the appearance is a work in progress, but the taste from the long cold fermentations is fantastic. The crumb speaks for itself. edited to add: Maybe the nicest baguette-type crust I've produced in an all sourdough version. Pretty thin and very crispy. bread samples louis! Eye candy for sure. I'm guessing that the taste of #2 was what makes it very special? Nice work Mr Brown. Absolutely, dabrownman, the taste of this bread is rich, deep and complex. It improves over a day or more. By varying the inclusions, you can alter the flavor profile. An active starter, a fairly short bulk fermentation and the cast iron cooker yield a loaf with an interior that is not at all dense. Really a good bread and a point of departure for so many varistions. It's the one my wife always asks for. Beautiful breads all round Louie. Wouldn't it be so convenient for bread baking if the the temperature were the same all year round? Bread baking for me is a bit like playing an artificially intelligent arcade game: just when you think you have mastered it, it generates a fresh set of obstacles. Lovely scoring and great open crumb. I agree with you on the baguettes: it has to look like a baguette to be called a baguette no matter how good it tastes. Thanks for the nice comments. You're right, the variables inherent in home baking at this level can turn the whole process into something surreal and often very frustrating. We do it for the challenge, right? As for the "baguette," I think we just need to change the form slightly and call it something else and it'll be the right thing. 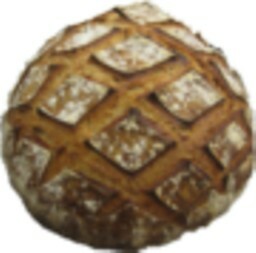 Beautiful bread, anyway and just the right amount of text to accompany those beautiful photos. I like the idea of adding some dark flour and making a flute. That sound really good. I could see using rye, buckwheat (a favorite of mine) chestnut, stuff like that. Is there a formula or method you can suggest, or should I do it the way I normally do, by the seat of my pants? "by the seat of your pants"? <GASP!> Then, by all means, please continue! I haven't been able to get any of the flute formulae to work yet, but that could be for a lot of reasons, especially lack of effort, recently. I'm paying attention (probably an undue amount!) to the Glycemic Index [G.I.] of the foods I buy and bake, so I'm moving towards more rye and other whole-grains in my diet...just as I got "the pain au levain to die for", I decided I needed to switch to a pain de seigle or something even more 'whole-grain'. I'm not a 'newby' with rye breads, but I suspect that an entirely new learning experience awaits as I try to incorporate more W-W and whole spelt into my repertoire...because of my crazy work schedule, I have to use the "seat-of-the-pants" method way too often. My results are pretty variable, as you can imagine. That's evidence of "right" fermentation. Thanks, David. You guys still have me eyeing one of those proofers, though. a winner, Phil. Even better, it offers a good deal of flexibility. By the same token, the long cold fermentations of the white breads give a terrific flavor too. Thank you for the compliment. I wish I had your natural light for photography. I don't have the patience to play with the white balance. What fine-looking breads - all are beautiful - perfect crumb and lovely scoring. So nice to see what you've been baking and to see your success managing temperatures and fermentation. Thank you so much! I'dlike to try some new things, but I seem stuck on tinkering with the regulars, always looking for a new way to improve them. Looking at your posts helps a lot. Best wishes. Very beautiful breads Louie, all of them! The burdens we bear, no?